Whether you lose weight boxing depends on your diet and the intensity of your workouts. Eat a balanced, low-calorie diet that provides you sufficient energy for your training. Focus on developing fast footwork, which will make you an effective competitor and increase the number of calories you burn. If you're not interested in being a competitive boxer, work on high-intensity drills and fast movements to maximize your weight loss potential. Your current body weight affects how many calories exercise will burn. That's because the more you weigh, the more energy it takes for your muscles to move your body. A 125-pound person who spars for 30 minutes burns 270 calories, according to Harvard Medical School. People who are heavier will burn more; for example, a 155-pound person who spars for 30 minutes burns 335 calories, and a 185-pound person burns 400 calories. If you add more lower body movement to your sparring, you'll burn more calories. Kickboxing and other martial arts use many of the techniques found in traditional boxing but also include vigorous movements of the legs and feet. The additional movement leads to greater weight-loss potential. A 155-pound person who participates in kickboxing or similar martial arts activities for 30 minutes burns 372 calories, more than a person of the same weight would burn boxing, Harvard Medical School says. 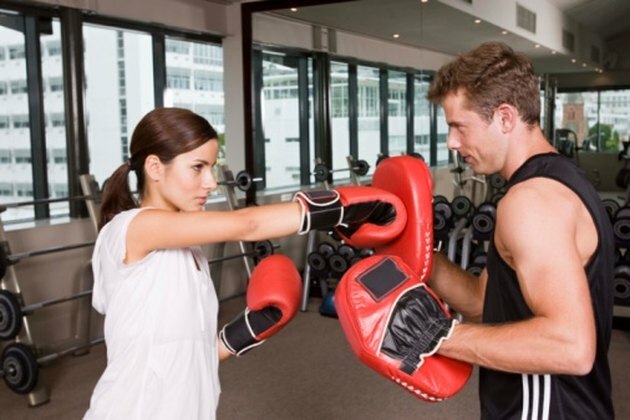 Boxing offers a variety of health benefits besides the potential for weight loss. It's effective cardiovascular exercise because of the continuous, vigorous movement. Like other cardiovascular exercises, boxing improves your strength, increases your balance and agility, tones your muscles and strengthens your heart and lungs. Regular exercise also improves your mood and staves off feelings of depression. To maximize the health benefits and minimize the risks inherent to boxing, hire a trainer to show you how to punch and block effectively. Let your trainer know you want your boxing training to focus on weight loss. The trainer will likely provide you with boxing exercises that build your endurance, develop your strength and lead to weight loss.